Greetings! I hope all of you aren’t suffering from a case of the Mondays and that your week is off to a spectacular start. My legs are still hurting from hiking Mount LeConte last week but I’m being very truthful when I say it was absolutely worth it. I had an eventful weekend and I enjoyed following so many of my internet friends on social media as they accomplished some huge races this weekend. Congratulations to all who raced Chicago or any other race and a big congratulations to those who got in one of their final long runs before their big fall race. You all rock! Since I’m sure you all are so interested in my life since I last posted, let me give you the run down on all the shenanigans that took place. Townsend 10k. I did a fun little 10k through Townsend on Saturday morning. There were only 36 runners in the field but I love a good small race. I did this race in 2010 before I lost weight and finished dead last with a time of 1:24:29. This year my only goal was to finish since I still had tight calves from hiking and I am doing a half marathon this coming weekend. The race ran down the sidewalk to the end of town and then we went through an underpass to the other side of the road and came back on the bike path. It was a perfect course except I would have preferred we did the bike path first and came back on the sidewalk since all the hills were at the end of the race. I started very strong and was on pace for a PR (although my goal wasn’t to PR) but I tried not to focus on the numbers and to just get my miles in. 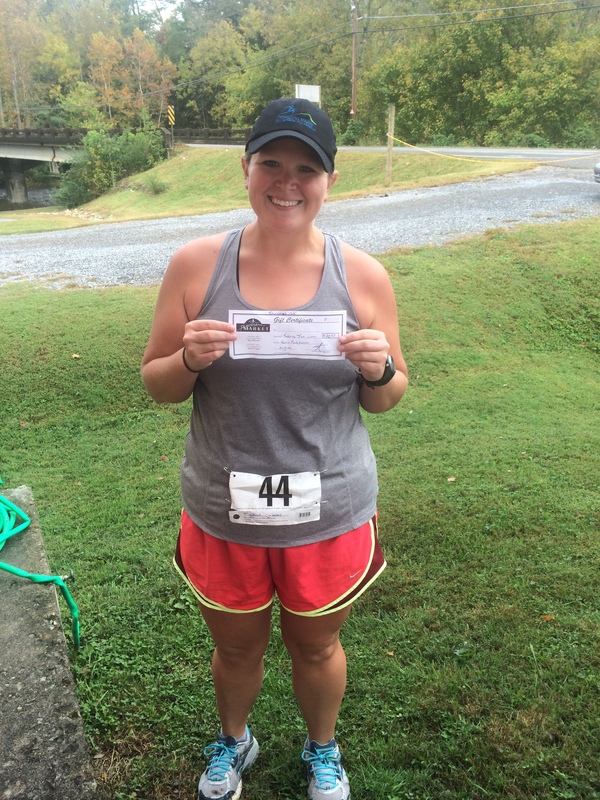 This was the first race I have ever ran wearing a hat and I did so because it was pouring rain prior to the start. The rain ended up stopping right before the race and the hat made me hot the entire time. Around the four mile mark I started to struggle and went to a run/walk combination. I watched my pace drop and knew that even though I wouldn’t come away with an overall PR I could still blast my time from the previous race and set a course PR. The finish line saw me at exactly 1:08 which was a lovely 16 minute PR and I couldn’t have been happier. I was so thrilled to be finished and even more thrilled that my stomach cooperated both during and after the race. Age group awards were only given to the 1st place finishers but I finished second out of three runners in my group. This race also had door prizes and I was fortunate enough to win a $20 gift card to a local running store. I’m sure I can easily spend that and find something that I like so all in all the race was completely worth it. 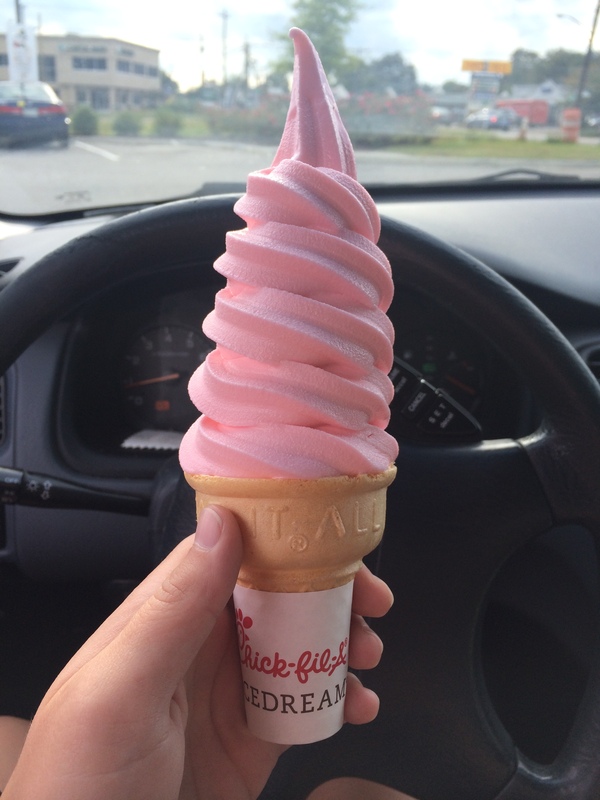 Chick-fil-a has pink ice cream. Yes, you heard me right. Chick-fil-a is one of the only types of ice cream I like and every now and then I will just swing in to get me a cone of that vanilla goodness. Imagine my surprise when they handed me a pink ice cream cone. Initially I thought that they had made it just for me since it is my signature color (I kid), but obviously they had added coloring to it for Breast Cancer Awareness Month. Hopefully ALL Chick-fil-as are doing this because I think it is a grand idea. Reflective vests from IKEA are totally not attractive. My Momma is one of those impulse shoppers so when she saw reflective vests at our recent visit to IKEA she just *had* to buy one. Her theory was that I could use it during my early morning runs to avoid getting hit by the paper boy. Well, I finally broke out that fancy vest and let me just tell y’all…I could totally be a construction worker model. Seriously. This vest is just so flattering that I know you all will dash to the nearest IKEA and pick y’all one up for about a dollar. Momma’s impulse buy is worth the price of safety and fashion. 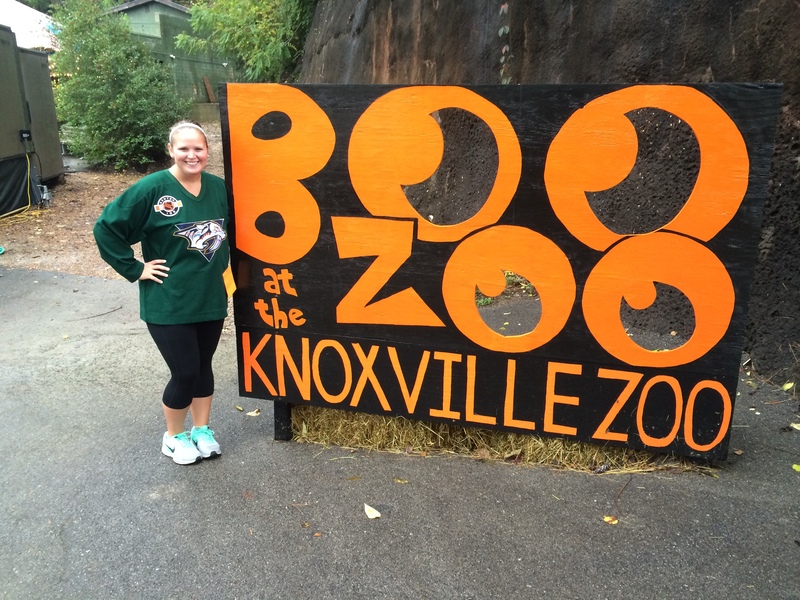 Volunteering at the Knoxville Zoo. Our local zoo has an event every year called Boo at the Zoo. It depends on volunteers to work booths and hand out candy to the kids that come. I chose to volunteer last night and worked at a sports themed booth. Since “cute runner girl” probably wouldn’t look like much of a costume, I chose to wear a hockey jersey that I got for Christmas in 3rd grade. It rained the entire time but parents still brought their kids and I was glad to get some service hours in. My only complaint is that I couldn’t see any of the animals so hopefully next time I can check out the panda exhibit or the river otters. I’m sure you all are so jealous of this exciting life I live. One day I will look back and miss the times that a pink ice cream could completely make my weekend. Until then, I’m going to enjoy it while I can. Hopefully you had an exciting weekend! 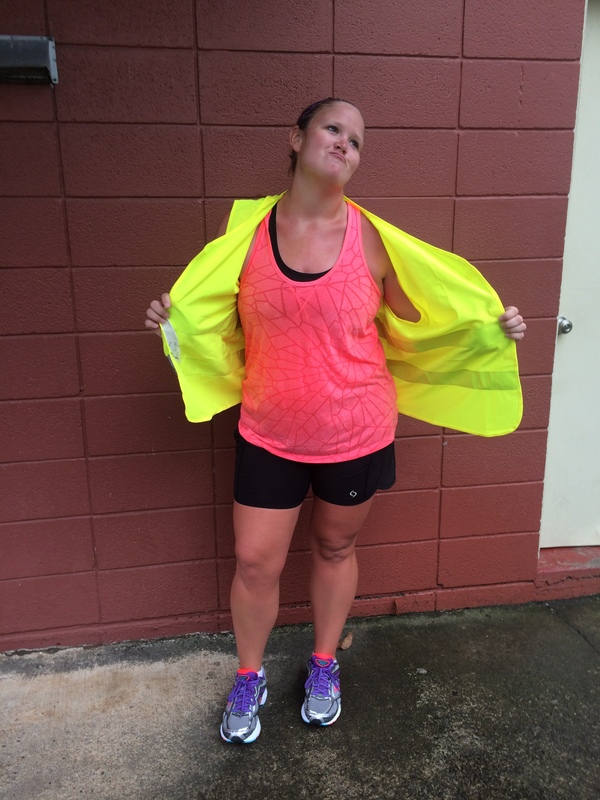 Do you wear reflective gear to run in? Do you have a zoo near you? Love the pink ice cream idea! That cone makes me want ice cream, and it’s not even 9 o’clock. Way to go on the race. Have a great week! after all the relays i’ve run that require reflective gear I finally broke down a month ago and got rid of my vest and purchases one of the V straps—- so much easier to run and worth the $30! I need to invest in a V-strap also…you don’t even realize you are wearing them! I’ve had that Preds jersey since the 3rd grade after watching Mighty Ducks and begging profusely and relentless for a jersey and hockey sticks.